Home Chef Review: An Inexpensive and Quality Meal Delivery Service? Cooking can be a chore. You have to go to the grocery store, buy more ingredients than you’ll need, and work off a recipe that might not even make a delicious meal. All that work for something you end up eating in 20 minutes. It’s no wonder so many people eat takeout almost daily. There is a better solution! Today we’re reviewing Home Chef, a meal delivery service that helps busy people save time and make scrumptious, simple meals. They say that each meal will only take about 30 minutes to make. All food for the recipes sent to your door are pre-portioned (no more wasting or throwing away ingredients). They put a large emphasis on sustainability. If all of these things sound good to you, keep reading to see what our Home Chef experience was like! What if I want to change my meal before it’s delivered? How do they choose what meals to send me? Can I skip a delivery if I am going to be out of town? Will Home Chef accommodate my food allergies? What happens if I am not home when my Home Chef meal is delivered? We have ordered off of meal delivery service websites many times before. Many can be a bit confusing to use and operate. There have been times where I’ve signed up for a service without even knowing what meals were going to be sent to me. Website usability is key in choosing the right food subscription service. First, you start by inputting your email address and zip code just to confirm that they can deliver to your area. You’re then directed to a screen where you can set your meal preferences. This page is perfect for picking what type of meals you want to get delivered. Too often meal delivery services fill their selection screen with tons of questions, making it tough to complete. Home Chef makes setting your preferences easy. In fact, I finished setting my preferences in under 15 seconds! How many meals would you like to cook each week? Which day of the week would you like to receive your meals? Do you prefer meat, seafood, and/or vegetables? Would you like to avoid any ingredients? Then you simply input your address, billing details, and you’re all set! Based on your food preferences, you will be matched with a meal or meals that fit you perfectly. If you don’t like the food you were matched with, you can easily go in and change it before it is sent to you. What I enjoy most about Home Chef is that they favor quality over quantity. Going to their menu page, you will notice that there are not a ton of different options. This is because they put a lot of effort into making those 10-15 meals the best that they can in terms of ingredients, flavor, and more. Not only does less selection mean you’re getting a quality meal, it also means you don’t have to spend hours sifting through hundreds of different pre-made meals to find the one you like. I often get what is called “decision paralysis” in situations where there are too many options (for example, when you go to a restaurant and there are hundreds of menu options). Too many options and I end up not wanting to make a final decision. Home Chef makes life easier by only giving you the highest quality options available. All of the meals sent are created by top chefs who actually provide their expert insights on how to best prepare the food. All meals are delivered weekly. However, you get to choose the day you want them delivered. This is another huge plus when it comes to meal delivery services. Many other options out there don’t let you choose the exact date you want the food to arrive. This can make it hard to schedule when you’re going to eat. To keep the food as fresh as possible, they ship it fast and in a biodegradable, insulated box with cool packs that keep the food refrigerated (not frozen). That way, if you’re not home and they deliver it, the food will still stay fresh. When opening the package, I found that all of the food was organized into bags or containers. Everything was nice and cold, as expected. Upon inspecting the ingredients, I could see, smell, and feel that everything was very fresh. Nothing seemed old or out of date. This made me want to start cooking as soon as the package was delivered — it was like Christmas morning! Once dinner time came around, I was excited to start cooking. The first thing I did was review the recipe card that came in the package. Unlike a lot of other meal delivery services I’ve tried, Home Chef made their meal instructions very simple to read and understand. Some other services put no effort into their instructions and cooking can seem like putting together Ikea furniture – very hard. In addition to the meal instructions, they include helpful information such as estimated meal preparation time, cooking time, the timeframe in which the food should be cooked, and a rating for how simple it is to cook. You’ll also be able to see a nutritional outline. This is very helpful for people on diets or people who need to eat (or not eat) certain portions of carbohydrates, proteins, sodium, or more. Cooking the meal was as simple as could be. I am not the best cook and yet I was able to put together a meal that would rival many of the options available at nice restaurants. All I needed to do was follow the recipe card and make sure I kept track of the time that certain things cooked. The meal we made to review taste for Home Chef in this post was the Grilled Pork Chop with Whole Grain Dijon Sauce. It also came with red potatoes and green beans. Every time pork chop has been cooked for me in the past, it has come out dry or too chewy. Because of this, I wanted to see how well Home Chef could make it. I was very surprised with the meal. When biting into it, the pork chop nearly fell apart in my mouth. It was the perfect balance of lightly salted and savory. When mixed with the whole grain dijon sauce, it added just the right amount of zest. The green beans and red potatoes were very fresh. The time that Home Fresh outlined to cook them both was perfect. Both were not too hard and not too soft. 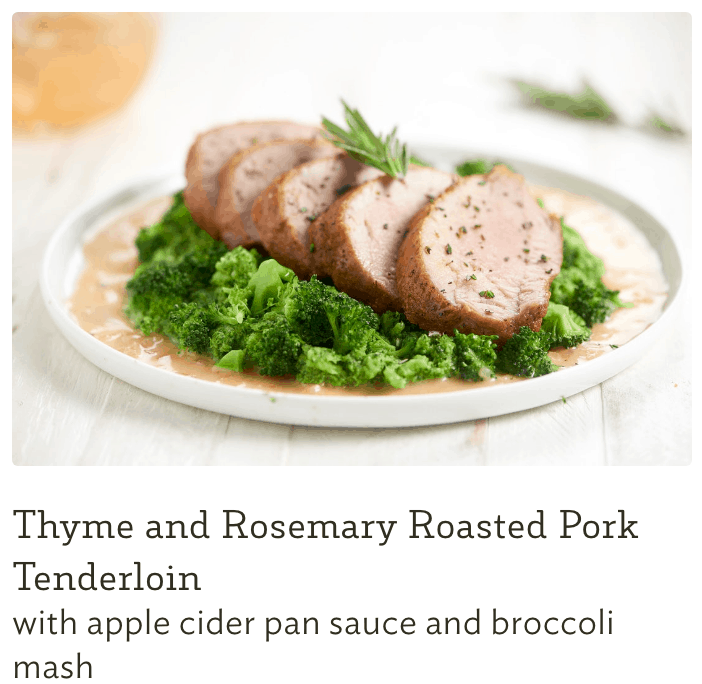 The added thyme was a great addition — it made the flavor leap off the food and onto my taste buds. All Home Chef meals are priced at a very competitive $9.99 per serving. When ordering $40 in meals or more, shipping is free. Otherwise, shipping is $10. For a delicious, easy-to-make meal, $9.99 is a steal. I added up the price of all of the ingredients I had to purchase to make my favorite salmon, brown rice, and brussel sprouts meal and it came out to around $8.50. For $1.49 more, I could have an even better meal delivered right to my door. When it comes to price and value, choosing Home Chef is a no-brainer. I get great food at a great price and don’t have to waste time at the grocery store. Now that’s what I call a win! Go right ahead! Once you sign up for Home Chef you will be assigned a meal based on your preferences. If you don’t want that meal delivered, you can swap it out for any other meal available. The meals that Home Chef chooses for you will be based on the preferences you outlined before your first meal arrives. Every subsequent meal suggestion will be based on these preferences too. If you want to change your preferences, you can at any time via your admin panel. Yes, skipping a delivery is easy. Many people do it when they go on vacation and don’t want a meal to go to waste. All you need to do is go into your admin panel, click ‘Account’ in the upper right hand corner of the page and click on the week you’d like to remove from your schedule. At the bottom of the page you will see a button called “Skip Week”, click that. You will not be charged for skipping a week. Yes, Home Chef accommodates many food allergies and other food preferences such as soy, gluten, nuts, and more. Don’t worry! Many people are not home when their meal is delivered. Home Chef packs all meals into secure boxes filled with a special type of cold pack designed to keep your food fresh for long periods of time. Once you do get home, place all of the ingredients into your refrigerator. Home Chef delivered to 98% of the United States. There is a very good chance that they can and will deliver your meal to you (no matter where you are located in the US). 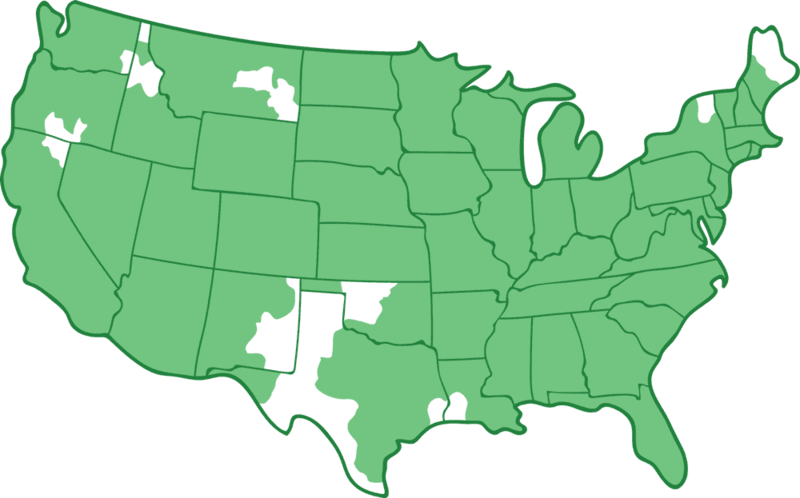 Map of Home Chef delivery areas. Overall I am very happy with Home Chef. It definitely surprised me. It isn’t the most popular meal delivery service and it certainly isn’t marketed as much as Blue Apron or even Hello Fresh but it is definitely a contender for being one of the best. First, the price of Home Chef is hard to beat at $9.99 per serving. I’ve seen similar quality meals go for upwards of $12 and $13 per serving. Second, it’s easy to use. Their interface for helping you choose a meal based on your preferences and select your schedule is as simple as it can get. Need to make a change to your meal or delivery date? A few clicks and you’re done. Third, it saves time. Besides the fact that I enjoy eating food made from quality ingredients, I also enjoy saving time when I can. Going to the grocery store isn’t just time consuming, in the city where I live, it’s a downright hassle. I feel like Home Chef has helped save an extra two hours a week that I would have spent walking to the grocery store, picking out food, and waiting in a checkout line. Lastly, Home Chef goes for quality over quantity. The ingredients are fresh and the meals taste amazing. This means that you can step outside of your comfort zone and select meals that you might have never tried before. Like I said before, I would have never chosen pork chops for a meal but Home Chef surprised me with how good they ended up tasting. Home Chef has been one of the most consistent meal delivery services in terms of meal quality, taste, and ease of cooking. While they aren't as well-known as some of the other big meal kits on the market, they certainly are as good (if not better). Tried this with my family. 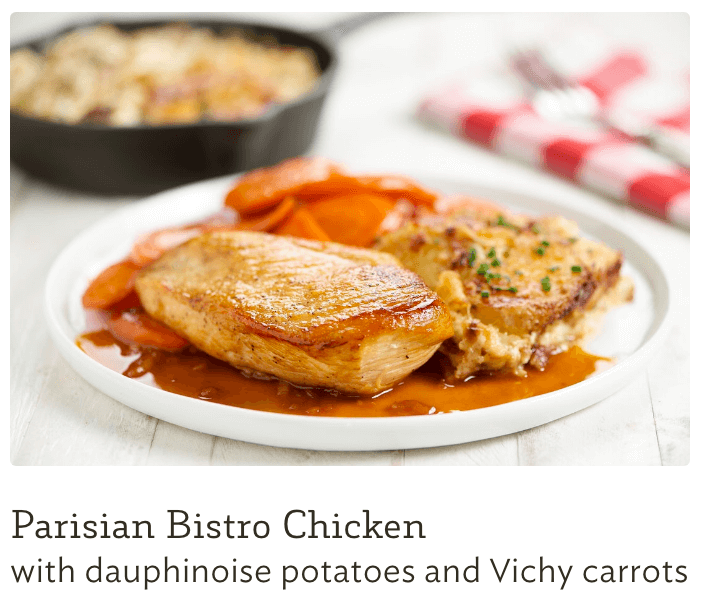 Easily one of the best ones… Yes, we’ve tried Blue Apron and Hello Fresh. 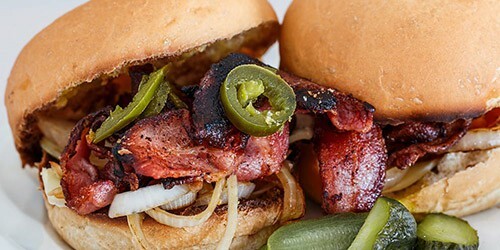 The recipes we’ve received from Home Chef have seemed fresher, more unique and simple to prep/cook. I don’t even check the meals they’re going to send anymore because I trust them now hah! Hello and thank you for such a detailed review and video. How would you compared Home Chef vs a regular grocery store? I saw an advertisement of theirs a while ago where they claimed to be cheaper than buying from the grocery store but I’m still not sure. I am trying to compare pricing. Any of your help is very appreciated. Hi Tara! Home Chef can definitely be a bit cheaper than the grocery store. Remember that when you go grocery shopping you’re also paying for things like gas for your car. With Home Chef, you’re not. Also, Home Chef sends pretty unique meals (more than just grilled chicken). So considering you’d have to buy a bunch of ingredients to make one of their meals, it could add up when shopping.